When death hides in plain sight, only the most discerning eye can see the truth. Forensic anthropologist Dr. Matt Lowell and his team of grad students don’t go looking for death—it usually comes to them. But when one of Matt’s students suspects the skeleton hanging in a top competitor’s lab is actually from a murder victim, Matt has no choice but to sneak in to confirm a suspicious death. Once the case comes to Massachusetts State Police Trooper Leigh Abbott, the team is back together again. While trying to handle the new murder case, Matt and Leigh also uncover new evidence behind the mysterious deliveries intended to smear the name of Leigh’s father, an honored cop, fallen in the line of duty four years before. When the person behind the deliveries is finally uncovered, it becomes clear that lives are in jeopardy if they attempt to thwart him. At the same time, as the murder case delves into underground societies and grows complicated when the killer himself becomes a victim, it will take all of Matt and Leigh’s teamwork to solve both cases and escape with their lives. I love when I come across a new series to sink my teeth into, so my thanks to the author, Jen J Danna for the ARC of this book – loved it! 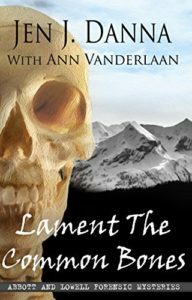 Lament the Common Bones is set in Massachusetts, USA and introduces the reader to loss; guilt; a search for the truth; relationships; corruption; blame and justice – though there is much more to discover too! Wow! I absolutely LOVED the pace, writing style and characterisation within this novel! This was a compelling and complex but not confusing plot which kept me enthralled from first page to last! Having read another series from this author, it is clear she knows how to set strong storylines and merge them seamlessly! I absolutely adored the forensic anthropology angle – I am a HUGE fan of Kathy Reich’s and in a similar vein to her books, this one oozed realism and authenticity. As mentioned, there are a few threads running through the story which I found to be descriptive and fact-based but it did not read like a manual! I was immersed in the forensic/technical side and seeing the pieces of the puzzle come together. A skeleton in a lab leads to skeletons in closets being unearthed- cue Matt Lowell (a forensic anthropologist) and Leigh Abbott (a Massachusetts State Trooper). I really enjoyed both of these characters and despite not having read the previous books in this series, I easily followed their relationship with each other and other characters in the book. I loved Leigh’s determination and focus but also her vulnerability; guilt hung around her neck like a noose but she used it to search for the truth and bring justice to those that needed it! Matt is intelligent, witty and slightly sensitive at times, but I found this endearing! I can’t wait to go back to where it all started! I can’t end my review without mentioning Oakes ….hmmm…how do I say this nicely…what a bloody arse! When you read the book, you will find out exactly why! Would I recommend this book? Hell to the Yeah, I would!! With twists that kept me guessing, a fantastic line up of intriguing characters and a plot that had me glued to my seat- this may just make one of my #TopReadsOf2017! This entry was posted in Book Reviews and tagged #ActionPacked, #Crime #Twists #Murder, #CrimeFiction, #CrimeThriller, #Series, #Suspense, #Twists by crimebookjunkie. Bookmark the permalink.